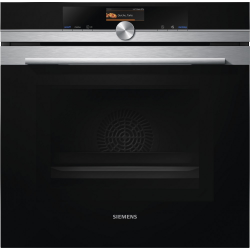 The truly multi function Siemens HM656GNS1B single oven boasts a very respectable list of 13 useful cooking functions, all of which take the strain off the food preparation process. One such feature, which is not often included on ovens, is the full colour TFT touchDisplay. Rather than twiddling with knobs and switches, you simply touch the screen and select the cooking program, temperature, and duration. In some cases there are preset cooking features which allow a one-touch start. What about the microwave? Well, it’s included and can be used alongside the oven allowing for some very unique cooking modes. For example, simultaneously heating using the microwave and traditional hot air. Can you imagine doing a jacket potato in half the usual time, whilst keeping the outside crispy? With the HM656GNS1B the fantasy becomes a reality. Never burn yourself on the sides again with the simple but genius telescopic rail; simply pull it out and the entire shelf is now in front of you. Nice! We already spoke of convenience in regards to cooking modes, and this one is particularly cool. Yes, it’s Siemens‘ very own coolStart technology. No more preheating ever again, simply stick your item in the oven and it will preheat itself. Finally, a simple but effective little addition. It’s called softMove, if you’re familiar with soft closing cupboards then you’ve already got a great idea of the concept. In short, slamming the door is now impossible which should help to increase the appliance’s lifespan.